It’s hard to believe that I’m over 75% of the way through my pregnancy with our daughter. And with less than 8 weeks to go and a million things to do, I’m trying to be as productive as possible. And that means prepping the nursery is at the top of the list. Of course, there’s the fun part—buying ALL the things and decorating—BUT, all of those things need to be washed and cleaned before Evie can use them. A perfect project for a nesting mama. You might also enjoy our Balloon Gender Reveal! So while we’ve made great progress in setting up our nursery, as we get closer, it’s important to clean it even if everything is new. I mean, think about it, all those toys, clothes, and furniture items have been boxed, transported, and handled by machines and people you don’t know, so it’s important to clean them! But you also don’t want to use harsh chemicals when it comes to cleaning baby items. That’s why I’m excited about the new Clorox Free & Clear line, at Target! These new products are fragrance- and chemical-free but work just as hard as the classic Clorox products that your family has come to depend on. So even though I know my house will not be 100% spotless all the time, it’s nice to have amazing cleaning products I can depend on for the messes baby throws my way and for the things she uses. 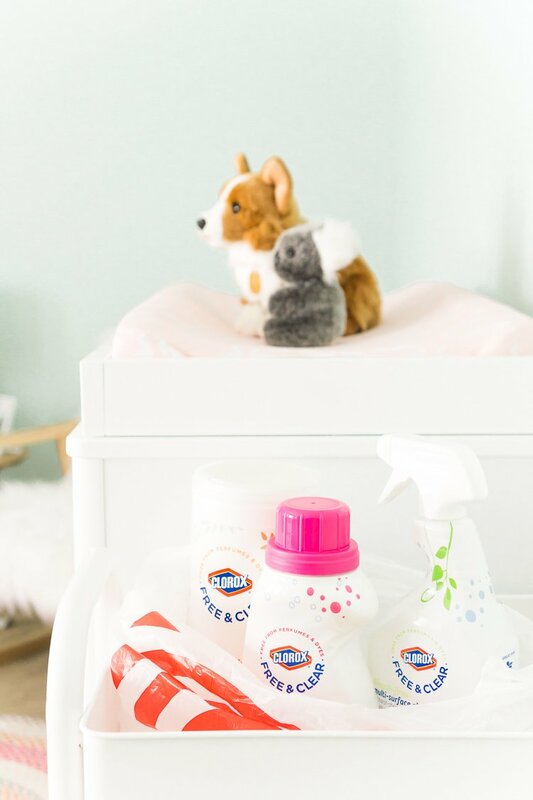 This new baby line that includes the Clorox Free & Clear Hard Surface Daily Wipes, Multi-Surface Cleaner, and Stain Remover delivers a powerful clean without harsh fumes or chemical residue. Learn More About These Products! 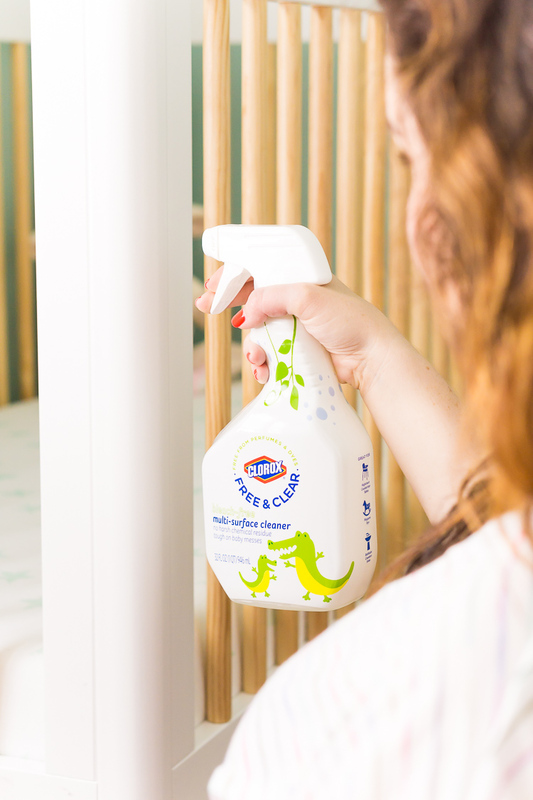 This means that the nursery, clothes, and other hard surfaces around the house stay clean and safe for baby. Try the new Clorox Free & Clear line for baby today and save 15% through August 18th with Cartwheel in the Target App! Clorox Free & Clear Hard Surface Daily Wipes – These will likely be an item that I will keep on hand in the nursery once Evie arrives. I bought a utility cart at Target to store essentials next to the changing station for easy reach. 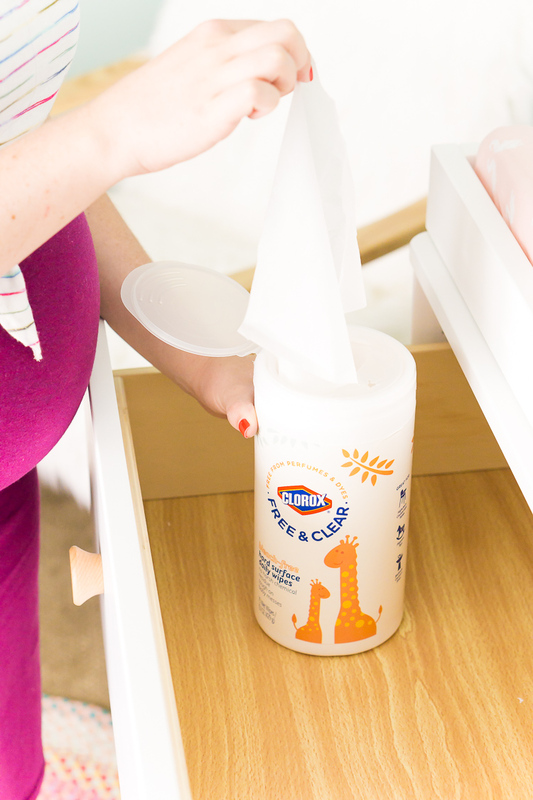 These wipes will be kept there, too, so I can easily (and quickly) grab them for any nursery messes. Clorox Free & Clear Multi-Surface Cleaner – This stuff is great. I’m using it to clean the nursery furniture, the windows, baseboards and more so that the room is sparkling clean when she gets here! 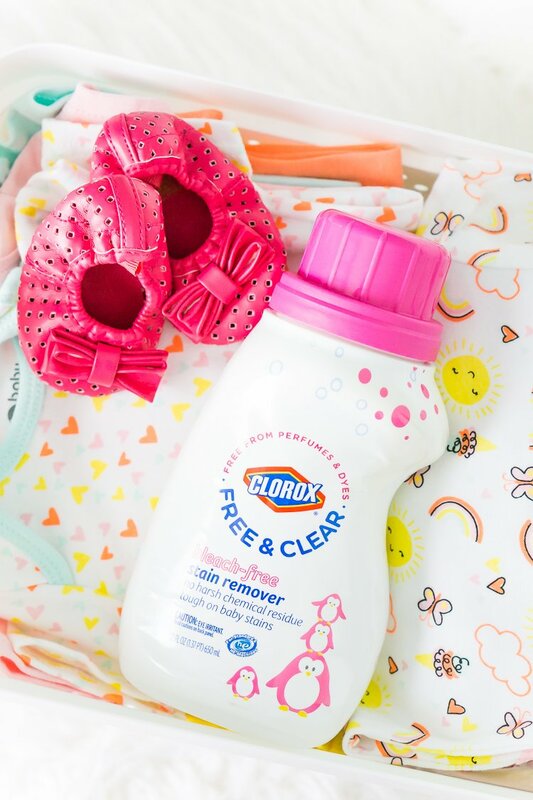 Clorox Free & Clear Stain Remover – We all know that baby clothes need to be washed before they’re worn, and I think we all find out pretty early in an infant’s life that babies will go through a lot of clothes each week thanks to the messes they make. This means that having a great stain remover on hand is a MUST! Because yes, there will be times when the cute lace romper just can’t be saved, but there are plenty of times when a little stain remover could save the onesie! Target has definitely been my go-to place for all things baby related, from the adorable clothing and decor to the products that will save my sanity like the Clorox Free & Clear line, found at Target in the baby aisle with the other cleaning products. These products would also make a fantastic baby shower gift for a new mama; pick up a cute basket from Target’s One Spot and some other great baby items, and you’ve got a wonderful (and super useful) gift on your hands! Are you an expecting mama? What great uses do you have in mind for this new product line?